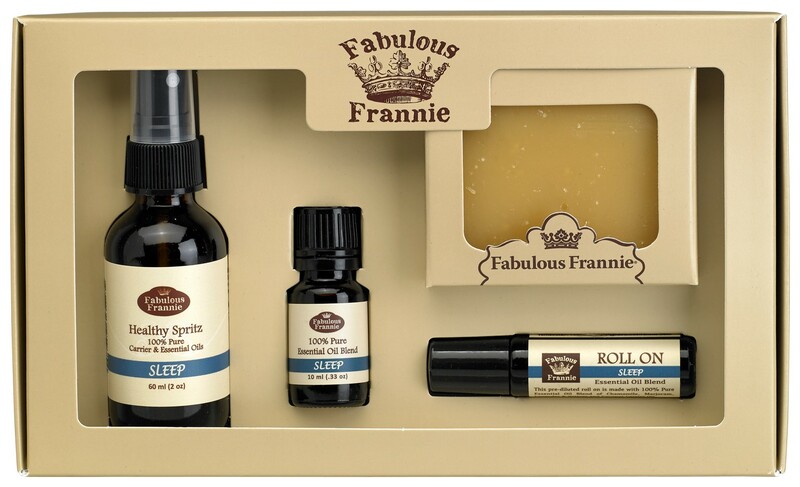 This blend of soothing essential oils eases your mind and body to promote more restful sleep. Sleep Blend contains Chamomile, Marjoram, Bulgarian Lavender and Vetiver Essential Oils. How to Use: Although there are many ways to use essential oils, here are two suggestions: 1. Combine with a carrier oil (approx. 6-12 drops per oz. of carrier oil), and apply to desired area. 2. Use in a diffuser to release the aroma and healing properties into the entire room. Ingredients: Chamomile Essential Oil, Marjoram Essential Oil, Bulgarian Lavender Essential Oil and Vetiver Essential Oil. Ingredients: Sleep Pure Essential Oil Blend and Coconut Carrier Oil. Ingredients: Grapeseed Carrier Oil, Jojoba Carrier Oil, Coconut Carrier Oil and Sleep Pure Essential Oil Blend. Ingredients: Olive Oil, Water, Coconut Oil, Organic Palm Oil, Safflower Oil, Chamomile Essential Oil, Marjoram Essential Oil, Bulgarian Lavender Essential Oil and Vetiver Essential Oil.